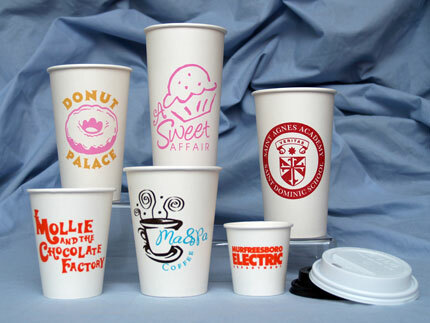 Description: Whatever your event, think about personalizing the CUPS! Whether a corporate event, a graduation or birthday party or whatever you can think of....you guests are sure to enjoy this added fun. Cups come in 4, 8, 12, 16 20 and 24 ounces. Can be printed on both sides in your choice of ink colors: light blue, blue, royal blue, navy blue, purple, orange, black, ivory, creme, light yellow, yellow, tan, light brown, brown, red, dark red, pink, hot pink, burgundy, light grey, dary grey, lime, green forest green, turquoise, gold, copper, and silver. Pricing: 4 ounces: 50 for $54, 100 for $71, 250 for $122, 500 for $20. 8 ounces: 50 for $55, 100 for $73, 250 for $127, 500 for $216. 12 ounces: 50 for $60, 100 for $83, 250 for $151, 500 for $264. 16 ounces: 50 for $62, 100 for $86, 250 for $160, 500 for $283. 20 ounces: 50 for $66, 100 for $95, 250 for $183, 500 for $328. 24 ounces: 50 for $71, 100 for $104, 250 for $205, 500 for $373. 4 ounces LIDS: 50 for $5, 100 for $11, 250 for $28, 500 for $55. 8 ounces LIDS: 50 for $11, 100 for $22, 250 for $53, 500 for $106. 12-24 ounces LIDS: 50 for $10, 100 for $20, 250 for $50, 500 for $100. Quantities available in 50's. Inquire for other pricing than what is shown here. Pricing is for one color ink, inquire for pricing for a second ink color.